Sauteed Broccoli | Simple and Delicious ! Though my small village has been developed a little, we have to depend the faraway shops even to get some coriander leaves! So I see broccoli only when we visit Dubai. This time I tried to make some simple dishes with broccoli. Normally I simply steam it, put some pepper and salt and have! I just checked the price and found it is approximately same as of 1 kg of Indian mutton! So there is no chance for it to reach our nearby market in Kerala,if it happens, people will prefer buying mutton..
Heat oil, saute chopped onion. When onion is semi transparent add garlic and ginger. 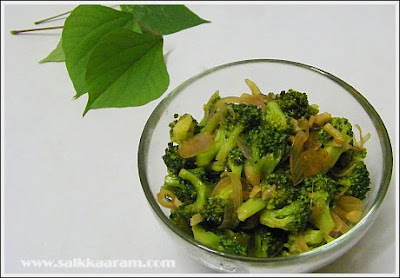 Stir for few seconds and add green chillies and broccoli with pepper powder. Cook until broccoli is done. Add salt, mix well, garnish with coriander leaves. Simple and delicious, love Broccoli. Love broccoli in any dish. Love the taste of it. Very simple and tasty recipe. yummy in my tummy any day. 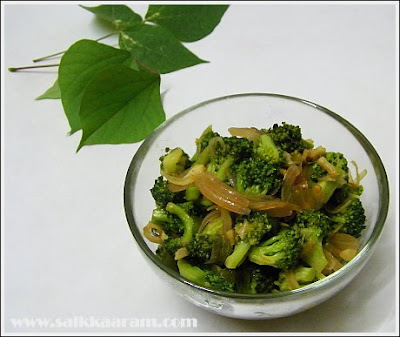 recipe look wonderful..i too make sauteed broccoli at times.but both my hubby and kid hates it..well he hates anything that falls under the category of vegetables so i am helpless!! after a longtime I'm here..brocollo looks yumy and delicious..do drop by.. I love broccoli! I think this is the only green vegetable that I love.